example of High Gothic design. see: History of Architecture (3,000 BCE - present). please see: Medieval Art (c.450-1450). the wall of the cathedral (right). If Romanesque architecture expressed the protective strength of God in unpredictable times - Gothic architecture reached for the sky and celebrated the perfection of God's universe. Using a range of innovative features, the Gothic style replaced the dim and narrow Romanesque naves with brighter, more spacious interiors filled with light that poured through the huge Gothic windows. In time, Gothic naves would soar vertically upwards and walls would soon be covered in glorious stained glass art to worship God and inspire the congregation. Originating in the Ile de France, Gothic cathedrals were not always built in one go: more often, between 50 and 100 years were needed - sometime much longer - before a cathedral was fully complete. As a result cathedrals tended to be built using a mixture of Gothic styles, belonging to one or more of three phases: Early Gothic (1120-1200), High Gothic (1200-80) and Late Gothic (1280-1500). High Gothic broadly coincides with Rayonnant Gothic architecture, while Late Gothic coincides with Flamboyant Gothic architecture. In English Gothic architecture, these variants are represented by the Decorated and Perpendicular styles, respectively. Gothic art signalled a major change in attitude. Romanesque buildings were intensely practical, and could double up as military or defensive structures. In contrast, Gothic buildings were intensely unworldly. They sought to inspire people and to express complete faith in the perfection of God. To do this, as well as employing the latest architectural innovations, Gothic architects and their patrons employed thousands of craftsmen, including dozens of artists. As a result, the French Gothic cathedral was a vast treasury of Christian art, involving stained glass, statues, reliefs, wood carvings, mural paintings, tapestries, illuminated manuscripts and precious goldsmithery. Gothic Cathedral Architecture: How Were Cathedrals Built? Around the middle of the 12th century, a new artistic sensibility with new architectural principles began spreading from the cathedrals of northern France. The Romanesque church gave way to an organism that replaced the construction system based on thick load-bearing walls in favour of a structure - called a skeletal system - that freed itself of all superfluous parts by identifying the forces acting on the interior - the thrusts of the vaults and the weight of the roof and walls - so as to direct them along predetermined routes. This transformation took place over the course of little less than a century and began in the Ile-de-France (Parisian region), where the desire to build very high naves resulted in close attention to the technical and formal aspects of construction. This preference for high naves, inherited from certain architectural currents of Romanesque art - from Cluny to the great Ottoman cathedrals - became the central compositional element of churches, leading to a new way of perceiving space and articulating it following a geometric division marked off by the vertical forms of pillars running to full height and pointed arches. As part of the 'skeletal system', the ribs of the vaults form an arched framework that concentrates the thrust from above and transfers it to points that are externally reinforced by rampant arches, which are in turn counterbalanced by flying buttresses that transfer the thrust of the weight to the ground. From the formal point of view, the upward soaring of the interior structure, the bay used as a module to create the internal space, the articulation of the walls, and the great expanses of windows result in the dissolution of the walls, replaced by a 'diaphanous system'. The autonomy of the parts is reduced in favour of greater spatial fusion, and the multiplicity of visual lines results in evocative effects of expansion. This agile and elastic structure frees the walls from their load-bearing function, making possible the broad expanses of windows with polychrome glass that bring rays of coloured light into the church interior, filling that space with its mutable shadings. This light, so different from the half-light of Romanesque churches, became the fundamental element in the figurative theory of Gothic architecture, which uses light physically and metaphorically to reveal the logical and constructive procedures - arranged in accordance with the scholastic thinking of the period - that support the construction of the cathedral. In the view of medieval theology, the Gothic cathedral was an expression of cosmic order and a symbolic image of the immaterial substance of God reflected in the harmony of the building's proportions and its luminosity. The spires, pinnacles, and towers of the facade accentuate the prevalence of the vertical, symbolic of the tension toward the divine; the door of the sky is illuminated, and it illuminates the interior thanks to the insertion of a great rose window, a true mystical membrane between the light of God and the heart of the faithful. The Gothic cathedral is also an expression of the new urban civilization that created it. These upwardly soaring, enormous, breathtaking churches were seen as reflections of the ideal image the period had of itself. Such was the fundamental incentive behind these buildings, and it led to ever more ambitious constructions. The imprint that Gothic left on the later figurative and architectural culture of Europe was the cause of heated critical debate, and beginning with Italian humanism in the 15th century many thinkers took a negative view of the apparently anticlassical aspects of the Gothic. The maniera dei Goti ('style of the Goths') was looked down upon during the era of Renaissance architecture as arbitrary and barbaric, but by the arrival of Baroque architecture, a number of great Baroque architects - principally Francesco Borromini (1599-1667) and Camillo-Guarino Guarini (1624-83) - were starting to grasp the technical qualities and the formal originality of Gothic structures, while the romantics of the 19th century embraced the Gothic wholeheartedly, looking at it with renewed fondness and re-evaluating its broad expressive horizon, thanks to figures like John Ruskin (1819-1900) and Viollet-le-Duc (1814-79). The architecture of France's Royal Domain was the source of the building methods of the mature Gothic, for the builders there sought to increasingly accentuate the articulation (or jointedness) of their structures while at the same time seeking to reduce the solidity of forms, causing greater transparency and illuminated space. Fifty years of experimentation produced results that were anything but homogeneous, from the cathedrals of the Paris region, which either had no transept or had transepts that projected only slightly, to the Picardy cathedrals of Noyon and Soissons, with complex layouts and large transverse bodies. The common denominator of these structures is the urge to achieve the greatest possible height, which in the more important examples translates into an elevation with four levels, justifying the presence of a triforium with the need to counterbalance the thrust of sexpartite vaults; the continuity between the nave, transept, and choir resulted in interiors of great elegance and astonishing effects of harmonization. The fusion of the double-wall system borrowed from Anglo-Norman architecture with the linear grid led to stratified structures of incredible lightness and transparency. The builders at Laon and Paris experimented with other technical and formal novelties; at Notre-Dame the vaults of the nave are supported by flying buttresses visible above the roofs, while Laon reinterpreted the Anglo-Norman technique of the mur epais by progressively stripping away the exterior wall, creating a 'telescopic' effect. These experiments were the precursors of the ponderous plasticism of the buttresses and rampant arches of the cathedral of Chartres. The architectural evolution of the cathedral from early to late Gothic was accompanied by an increased exaltation of light and the related opening of the walls through the use of stained glass. Builders were immediately drawn to the flying buttresses that made this opening possible, and their awareness of the powerful structural implications of these buttresses is indicated by the rapid spread of their use in increasingly elaborate and complex variations. In the largest constructions they are used in overlapping groups arranged in series; they are supported by increasingly powerful buttresses topped by pinnacles and spires that radically transform the exterior appearance of the structure, breaking up the volumes in a sort of perspective kaleidoscope or a replication of the rhythmic modulation of the interior bays. The column statue became a feature of the exterior, as did narrative relief sculpture around the doors and portals. There were equally important interior changes, for the use of flying buttresses made it possible to increase the height of the nave to the maximum technically possible without having to use tribunes above the aisles; the partition of the nave now reached its mature form, articulated on elevations with three levels of great size thanks to the elimination of the gallery. It was in the two great worksites of Bourges and Chartres, where work began around the same time in the middle of the 1190s, that the potentials for improvement made possible by the removal of the tribune - uncomfortable and hardly functional - were exploited to achieve a new monumental appearance full of balance and harmony among the parts and the whole. The cathedrals of Chartres, Bourges, Reims, and Amiens also experimented in the use of the so-called pilier cantonne, which permitted the central column to rise without interruption to the vault, augmenting the vertical sense and accelerating the compositional rhythm. The monumental concept of the great cathedrals is an expression of the ascent to the French throne of the Capetian Philip II (1165-1223), while the spread of the Gothic across Europe is related to the growing influence of French politics and culture over the course of the 13th century. As mentioned in the introduction, the typical Gothic cathedral was packed with various types of art designed to glorify God and inspire the congregation. Gothic sculpture was employed throughout the cathedral, notably in the form of narrative reliefs around the doorways, illustrating stories from the Bible. (Note: see English Gothic sculpture and German Gothic sculpture for a comparison with French works.) In addition, column-statues became an important decorative addition to the exterior. Inside the cathedral, the pulpit and choir were often decorated with intricate wood carving in a variety of figurative and abstract styles. Stained glass was another very important type of Catholic art inside a church, with entire walls seemingly devoted to it. The finest example is probably Sainte Chapelle in the Palais de la Cite in Paris. Biblical illuminations were another important ecclesiastical artform. Gothic illuminated manuscripts were unmatched by any other type of medieval painting and every cathedral would own a large number of exquisite gospels texts illuminated by master craftsmen. Goldsmithing was also very much inevidence, either in the form of reliquaries for holy relics, or liturgical chalices, crosses, crucifixes and the like. Artists would also be employed to produce a variety of altarpiece art, as well as tapestries, mural paintings and more. In short, the typical French Gothic cathedral is not just an architectural masterpiece, it is also a treasure house full of medieval Christian art. Even though Notre-Dame Cathedral Strasbourg is part Romanesque (most of the Romanesque structure burned down in 1176), it is generally considered to be one of the finest examples of Late Gothic architecture. 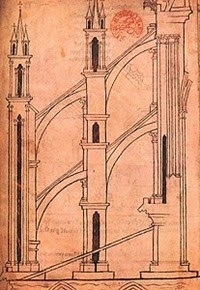 The German architect Erwin von Steinbach was a major contributor to the new Gothic design during the period 1277-1318. It has only one spire, although at 142 metres in height it made the cathedral the tallest building in the world from 1647 to 1874. It is also famous for its pink colour, which comes from the particular type of Vosges sandstone used in its construction. However, the cathedral is best known for the colourful hue of its interior, caused by sunlight pouring through its huge stained glass windows. Originally a large medieval abbey church, now a cathedral, Saint-Denis is considered to be the first Gothic church. Located on the site of the earlier Church of Saint-Denys de la Chapelle - built about 475 by Saint Genevieve and said to contain the relics of Saint Denis, a patron saint of France - the basilica became the burial place of almost every French king from the 10th to the 18th century, and attracted pilgrims from all over the country. The new Basilica was begun in 1035 under Abbot Suger (1081-1151), who rebuilt portions of the old Romanesque-style church using a number of revolutionary new structural features. Indeed, it represented the first design to concentrate the weight of the structure on relatively thin columnar supports. Known at first as the "French Style", it was later christened "Gothic". Saint-Denis is now acknowledged as the earliest example of a major structure to be designed and built in the Gothic style. Furthermore its 13th-century nave, built by Abbot Odo Clement, is also a prototype example of Rayonnant Gothic architecture, and an architectural model for cathedrals and abbeys across the Continent. Together with Bourges Cathedral and Notre-Dame de Paris, Laon Cathedral is one of the most outstanding examples of Early Gothic architecture of the 12th and 13th centuries. The present structure began with an early choir section and was finished as far as the east side of the transept by 1174. A second building campaign lasted from 1180 to 1235. The nave was erected with four tiers of clerestories, triforium and tribune under sexpartite vaulting, and then the initial choir was replaced by the greatly enlarged present choir. The cathedral's floor-plan is cruciform, and the choir ends in a straight wall rather than an apse. Its west facade - with its three portals, each adorned with Biblical sculpture, and its rose window dating to 1210 - ranks alongside that of Notre Dame (Paris) in the consistency of its Gothic style. Its spacial arrangement, for instance, is accentuated by the colossal dimensions of the openings and the enormous central rose window. The chiaroscural articulation of the facade is enriched with detail including the extraordinary inventiveness of the towers. One of the world's most famous Gothic cathedrals, Notre-Dame was among the earliest buildings in the world to use the arched exterior support, known as the flying buttress. Begun, like Laon and Bourges, during the Early Gothic, its transepts were later redesigned in the Rayonnant style by Jean de Chelles then Pierre de Montreuil. Its treasury is noted for numerous sacred relics, including Christ's Crown of Thorns and a fragment of the True Cross. Sadly, during the French Revolution, a good deal of its religious imagery was damaged or destroyed, although this didn't prevent Napoleon Bonaparte from being crowned Emperor in the cathedral on December 2, 1804. An extensive program of repair supervised by the restoration expert Eugene Viollet-le-Duc began in 1845. Notre-Dame was added to the UNESCO World Heritage List in 1991. Saint Gatien's Cathedral in Tours exemplifies the 15th century Flamboyant style of Gothic architecture, although it includes elements of three schools of architecture - Gothic, Romanesque and Renaissance. It is renowned above all for its sublime stained glass art and its ornate west front. The present building replaced a 12th century Romanesque structure, parts of which (including a section of the nave and the tower buttresses) still remain. The Gothic south transept and towers were erected about 1170, while the chancel (the area around the altar) was redesigned and built during the period 1236-1279, by the architect Etienne de Mortagne. Most of the nave, aisle and chapel were constructed in the 14th century, largely by the architect Simon du Mans, although the nave was only completed in the 15th century, thanks to the architects Jean Papin, Jean de Dammartin and Jean Durand, and the largesse of Charles VII and the Duke of Brittany. One of the finest complete examples of the French High Gothic style, Chartres is unusual for having survived largely intact. Its architecture has undergone only minor changes since the early 13th century, while most of its sublime stained glass dates back to between 1205 and 1240: indeed, four lancets contain panels of Romanesque glass which survived the fire of 1195. Most of its stone sculpture also survived. For example, the hundreds of figures which adorn its three great facades - West, North-transept and South-transept - all date back to the 13th century. In 1979, Chartres was added to the UNESCO World Heritage List of culturally important sites. Together with Notre-Dame (Paris) and Laon, Bourges Cathedral is a magnificent example of early Gothic architecture. Unusually, it has no transepts, which cross the nave in most Gothic cathedrals, although it does have a double-aisle. The absence of the transept allowed the architect of Bourges to configure the aisles as two stepped bodies that wrap the apse without interruption. The exterior structure is marked by thick walls and an array of slender flying buttresses - the arched external supports which absorb the weight of the vault and nave. Their steep angle allows them to channel the thrust to the outer buttress piers in a very effective manner. Bourges Cathedral has been listed as a UNESCO World Heritage Site since 1992. Designed by four master masons (Jean-Le-Loup, Gaucher de Reims, Jean d'Orbais and Bernard de Soissons), Reims Cathedral stands on the site of the basilica where Clovis (466-511) (first king of the Franks) was baptized by Saint Remi, Bishop of Reims, in 496. Together with the cathedrals of Amiens and Chartres, Reims (the traditional place where the kings of France were crowned) is one of three major examples of "High Gothic" architecture of the 13th century. The choir at Reims - with a single ambulatory - has five radiating chapels, the wall of which has a passage at the height of the windows that reveals its thickness. The windows form a single ogival opening increasing the sense of serene equilibrium. In no other building does Gothic architecture achieve an equally exact correspondence between exterior projection and interior space and at the same time the maxiumum unity of expressive clarity. The facade of the cathedral - extensively renovated in the late 19th century - features three portals decorated with numerous statues, and a giant rose-window dedicated to the Virgin Mary. The facades of the transepts are also adorned with reliefs, featuring a range of Biblical art, including a scene from The Last Judgment. Fire destroyed The cathedral's roof and spires were destroyed in the fire of 1481. In 1991 Reims Cathedral became a UNESCO World Heritage Site. Standing on a ridge overlooking the River Somme in the Picardy region, Amiens is one of the largest Gothic cathedrals in France. It was designed by Robert de Luzarches along with Thomas and Regnault de Cormont. The stone vault of the nave is 42 metres (138 ft) tall, second only in height to the incomplete Beauvais Cathedral. Although the majority of its original stained glass has been lost, the cathedral is noted for its 13th-century relief sculpture on the west facade (see photo, top-left) and the south transept portal. The focus of the west facade is the rose window, but the extreme height of the nave placed the window in a very high position, leaving the ground floor portals to be connected to the triforium by way of two superimposed galleries that further emphasize the close connection between the exterior and interior. Overall, the result is a highly articulated front - cut by deep shadows and loaded with elements at different levels - in sharp contrast with the severe simplicity of the interior. Amiens Cathedral has been listed as a UNESCO World Heritage Site since 1981. Best-known for its structural collapses, Beauvais Cathedral is also noted for its especially fine choir, described by Eugene Viollet-le-Duc as "the Parthenon of French Gothic", as well as its exquisite stained glass of the 13th, 14th, and 16th centuries, some of which was created by Renaissance artist Engrand Le Prince, a native of the town. (See: Stained Glass Art: Materials & Methods.) Work began on the cathedral under Prince-Bishop Milo de Nanteuil, following a number of fires in the previous wooden-roofed basilica. The choir was completed in 1272, with the highest vault of any cathedral in Europe - its height of 48 metres (157 feet), far exceeds the 42-metre nave of Amiens Cathedral. Unfortunately, in 1284, part of the vaulting above the choir collapsed - basically because the structure was too tall. Despite this setback the vaulting was rebuilt to the same height, though with additional supporting columns and a new sexpartite vault structure replacing the old quadripartite one. Construction continued during the 16th century with a new transept and an ambitious 153 metre high central tower. Then in 1573, the tower collapsed, after which few additions were made. Beauvais Cathedral is also noted for the wooden doors of its north and south portals - carved in Gothic and Renaissance style, respectively - as well as its collection of tapestry art dating back to the 15th century. Beauvais is considered a seminal example, since the collapse of its vault in 1284 marked the end of an epoch, and from then on, builders and patrons abandoned the aspiration for ever-higher structures which had been the key characteristic of Gothic architecture. Beauvais is considered to be the final development of the style established at Chartres and Reims - a point beyond which no one could go. Outside France, some of the greatest Gothic cathedrals include: the medieval Burgos Cathedral, in Spain, begun around 1221; York Minster, begun in 1230, whose Great East Window contains the largest expanse of medieval stained glass in the world; Cologne Cathedral begun in 1248 but not completed until 1880, the greatest example of German Gothic art; the famous Florence Cathedral, begun in the Gothic style in 1296 by Arnolfo di Cambio, and completed in the Renaissance style in 1436, under Filippo Brunelleschi (1377-1446); the 14th century St Stephen's Cathedral (Stephansdom) in the heart of Vienna; the massive Milan Cathedral begun in 1386 during the pre-Renaissance trecento; and Seville Cathedral, the largest Gothic cathedral in the world, built between 1401 and 1528.  Medieval Sculpture (c.300-1000) Late Antiquity to Romanesque.  Medieval Artists (c.1100-1450) From Gislebertus onwards.  German Medieval Art (c.800-1250) Carolingian, Ottonian, Salian.  Romanesque Illuminated Manuscripts (800-1150) Across Europe.  International Gothic Art (1375-1450) Sculpture, illuminations, painting.  For more about cathedral architecture in the Ile de France, see: Homepage.